Just woke up to see your DA score changed/dropped? Don’t worry, as it’s the same for every webmaster. On 5th March, 2019, Moz released Domain Authority 2.0 aiming to deliver a better and more accurate domain score. It is unarguably the biggest update to DA as a metric, ever since it has released. DA remained largely unchanged and has been calculating the score based on the same factors over the years, but with Google bringing in more & more algorithm changes over the years, the metric needed to adapt. Domain Authority (DA) is a score based upon your site linking pattern, hinting at the relevance of your site over other competitors website. It works upon a logarithmic scale, ranging from 0 to 100. The more the score, the better your website is, according to DA and is more likely to outrank a competitor’s website with lower DA than yours. If you’re a website owner or an SEO optimizer, you will know how commonly DA is referenced to. DA as a metric is used for various purposes, ranging from determining the success of your link building campaign to measuring the quality of a domain before purchase. With the launch of Moz’s new and revisited Domain Authority, many things have changed and improved. DA is not a ranking factor. The most important aspect of DA is how well it can correlate with search results. The closer its correlation is to search results, the better will be its performance in predicting rankings. This is one aspect Domain Authority 2.0 aims to deliver, to build a stronger correlation between the search results to offer more precise and accurate score. So, how is this correlation determined? What factors are being used? Truthfully, it can be done in various ways. Data can be fetched and used from the top 10, 20, 50 or even 100 SERPs to get to the desired results. What’s important is, the results need to be statistically significant and should have meaning in practical usage. As stated by Russ Jones, Principle Data Scientist at Moz, the correlation can be determined using “true first page”. The collection of SERPs was done on the basis of keywords-only and no additional parameter was used. True first page is what the users see and experience, thus the predictive power is basically focused on what the users are experiencing first hand. By not adding in additional parameters, the data is nearer to Google’s results. By not going beyond the first page, it is more likely to avoid manually penalized sites. 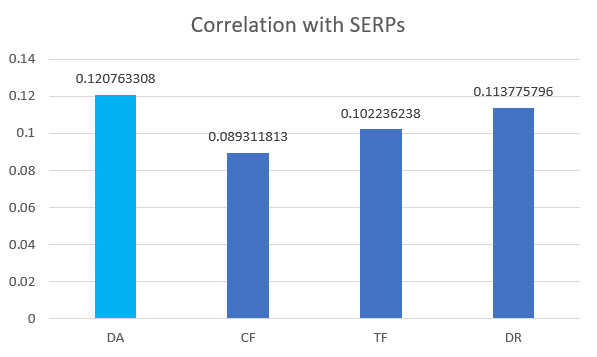 Calculated using the mean Spearman correlation coefficient for each SERP. The coefficients are averaged. Moz has again and again stated that Domain Authority is only a relative score. It must only be used to compare your website against competitors. However, with time, people have correlated Domain Authority with “domain value”. Following this, people have spammed links in particular ways to manipulate DA score. This allows link sellers to exchange domains with higher DA for a higher rate. With the new Domain Authority 2.0, Moz intends to remove this aspect completely, by changing their complex linear model and shifting to neural networks. These will be able to offer several benefits, by better analysing the links and detecting link manipulation. Moz has compiled different data sets, which correspond to different industries. These industries are where Domain Authority has been constantly being manipulated. The blue bars represent the old average DA score of a particular data set, while the orange bars represent the new average DA score for the same data set. It is easily recognizable that all categories have witnessed some kind of drop. Moz states that this can be seen as a re-centering of Domain Authority score, and should case no harm to your website, as your competitors will likely experience a similar shift in DA score. Dropping a few points after this update should be considered normal. To see how random domains have been affected by DA 2.0, Moz randomly selected 1,000 domains. The drop in their DA score was calculated to determine a 6.1% drop. Most website owners are likely to experience this drop, and there is nothing to worry about, if your score has dropped a few points. Moz customers have also as experienced a similar drop rate, as of random domains. The drop is averaged at -7.4%, which is very close to that of random domains. Moz claims that most Moz customers are not using DA manipulating techniques. Link buyers have lost 15.9% domain authority score with the new update. Not as high as one would expect it to be. This is because link buyers usually indulge in techniques, which are not as spammy. Most people who pay for links, also spend time and effort optimizing their website content, and these sites also rank in Google. Due to the new Moz DA update 2019 being focused on correlating its score closely to search results, it is unreasonable to heavily impact DA score. Neural networks determine that some techniques used by link buyers actually do work in favour of ranking. Comment spamming has been a rigorous practice among circles to improve a site’s DA by posting comments on a high authority blog. With the new neural networks at work, these are to be identified and penalized accordingly. Comment spammers have an average DA drop rate of 34%. Link sellers have been a big part of linking manipulation. These people tend to interlink their own blog networks to build up their DA. Afterwards, they charge higher prices for links from such blog. But more than often, link sellers do not optimize their websites beyond links. This is a common practice, and therefore, has been heavily penalized. Most link sellers will experience an average -56% drop in their Domain Authority. These are the people whose networks do not rank in Google, and usually put up bogus link profiles and low quality content on their website. Earlier there used to be a large data set, known as auction domains. Moz divided this particular data set, using certain parameters, such as TLD, price and archive.org status into high-quality, mid-quality and low-quality auction domains. The neural networks would recognize these as different, and high-quality domains will be impacted the least, while low-quality domains will be impacted the most. In this aspect, High-quality auction domains witnessed an average 61% drop rate in their Domain Authority score. This is certainly higher than a lot of other data sets, due to a great range of high-quality auction domains having a largely manipulated backlink profile. Again, a huge drop in Domain authority score averaged at 95% for mid quality auction domains. With the new update, neural networks at work are better at learning to distinguish a good backlinking profile from a bad/spammy backlinking profile. Most mid-quality auctions domains up for sale contain spammy links, or links from website with no standings in SERPs. The category to fall off the most have their domain scores dropped at an average of 98%. Neural networks separate the good links from the bad links. Your profile needs to be natural, and not be a huge mess of spammy links. 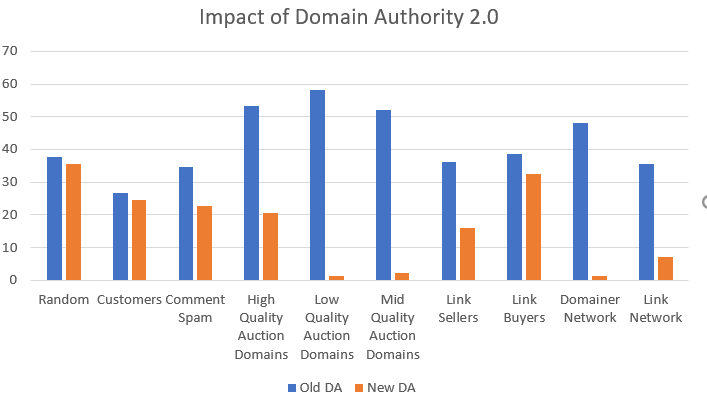 With a smarter network at work, Domain Authority 2.0 ensures that low-quality auctions domains are not pushed ahead in the metric race. Links network with a huge numbers of websites have also been dropped drastically with an average of 79% drop in total score. Unnatural linkings are yet again, penalized, without any questions. The results brought about are as close to Google, and if you are getting too many links from sites not ranking at Google, the neural networks will closely follow this. Domainer networks are a series of enumerated sites, linking to one another. For instance, the first site in this network may be called ntw1.com, the second being ntw2.com and so on. This network can consist from tens of site to thousand of sites. It is easy for a human to perceive this pattern, but with older DA this was not possible. The new Moz DA update 2019 is able to analyse this pattern and has dropped domainer networks by an average of 97%. For most website owners, the update will mean your Domain Authority score might drop a little, but so will your competitors’. For firms and agencies offering search engine optimizations, this can be a huge change. For link sellers, the huge inventory of high DA, low quality blogs will diminish. High DA links will become rarer and only the deserving will get a good score. The same can be said for people building PBNs (Private Blog Networks). All in all, while Domain Authority score will not affect your actualy ranking, it will provide a much smarter metric for users to assess quality of their linking profiles. How Will DA Be Useful? Following the new Domain Authority 2.0 update, you can use DA as you did before. It will still show you a rating between 0 to 100, but whats changed is the ‘smartness’ of the metric. Domain Authority can still be used for compare with your competitors. With new scores, the difference between you and your competitors’ backlink profiles will become more evident. The new domain authority will be updated historically, so you can track your DA overtime. If your DA is on the decrease, compared to your competitors, you most probably need to adapt and modify your strategies. While acquiring auction or dropped domains, users have a better metric to determine the quality of the domain. While it is not an absolute judgment metric, it can be a significant part of your deciding factors. Domain Authority is a big part of Moz. With the new update, a new shift has been made in the metric and for those who have been using it. As stated by Moz, opposite to their previous approach of keeping DA static and rarely updating the model, they will more frequently update it in accordance to any Google updates. The new Moz DA update 2019 will push a new model, which is more agile, up to the trend, and responds better to any SEO or algorithmic changes. With Domain Authority 2.0, you might be able to see a drastic change in your website score. Fret not, as something similar might be happening for your competitor. The new update pushes users to better optimize their website and build natural backlinking profiles, cutting off the shortcuts that were available with spammy links before. However, with machine learning being a major part of the update, we can expect bigger and better changes in future.